If you associate camping with cold showers and eating baked beans from the tin, think again! Camp sites now offer fantastic facilities, showers, power and even wifi – although you might want to switch off your smartphone and enjoy a digital detox. 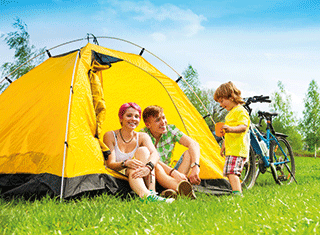 Tents come in all shapes and sizes now, so that entire families can camp together and there are plenty of ways to bring your creature comforts with you – portable espresso maker, anyone? If you want to go for a glamping experience you could leave the tent at home and enjoy the benefits of staying in a cosy cabin, yurt, hut or even camper van. There are plenty of good reasons why you might want to choose to hire a campervan, as it requires less set-up and will be warmer if the weather is chilly. However a good old-fashioned tent will be much cheaper and you really get to enjoy the true camping experience that way. Before you embark on your trip it’s a good idea to plan some fun outdoor activities such as walking, cycling, hiking or swimming. These are all great sports which will raise your heart rate and get the blood pumping – good for a health boost. Make sure you bring appropriate gear, such as well-fitting, sturdy hiking boots or cycling helmets. Plan your route or activity carefully – never go off on your own and make sure that children are always accompanied by an adult. Look up local walking routes before you go and always take a map and compass or a GPS to guard against getting lost. When packing, make sure any food you bring is kept in tight, waterproof containers and stored in an insulated cooler. Separate raw foods from cooked foods and wash your hands frequently. Take a natural hand sanitiser with you if water isn’t easily available. Protect yourself against carbon monoxide poisoning by never using fuel-burning equipment such as gas stoves, heaters or charcoal grills inside a tent or enclosed shelter. This can cause dangerous levels of carbon monoxide to build up, which is odourless and colourless and can cause death. Drink plenty of water during the day to guard against dehydration. Keep a good supply with you at all times and don’t wait until you are thirsty to have a drink. Protect yourself from the sun by wearing a wide-brimmed hat, sunglasses and using a broad-spectrum sunscreen. Avoid the direct sun from midday to 3pm as this is when it is at its strongest. 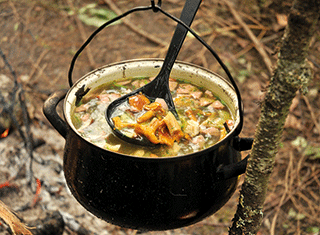 Here are some ideas for healthy foods that you can take on your camping trip. Make sure you bring a cooler to keep the food fresh and a camping stove to cook on. Make sure you pack a big cooking pot and cook up a big batch of soup or stew filled with plenty of veg that will last you for dinner and lunch the next day. Serve with quinoa for a healthy, protein packed accompaniment.